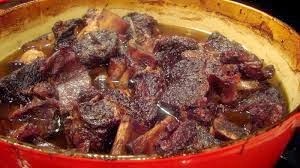 Braised Short Ribs This is my go to recipe for company. I love making this recipe. I have made it 8 or 9 times now, and every time it turns out perfectly, the meat just falls off the bone and it is a big hit. Every time I have served this, I have done it over mashed potatoes, the gravy is just perfect with it. I am going to apologize in advance, I am terrible about taking pictures as I go, but I will try to get better. I start out by salt and peppering, heavily, the short ribs. I always do bone in short ribs, I think it is the marrow that adds that extra flavor. I figure about 1 lb per person. Brown the ribs on each side in hot oil in a cast iron dutch oven. Remove from pan and rest on a plate. Chop carrot, celery and onion and add to pan, saute. 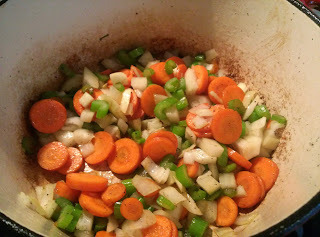 Add garlic. Saute until slightly soft and fragrant. Meanwhile, mix the liquids and whisk together. Add the short ribs back to the pan, layer a sprig of fresh thyme between each layer of ribs, pour liquids over the ribs, add extra wine if need be. You need to make sure that almost all of the ribs are submerged in the liquids. You do not want the ribs to dry out. I gave this recipe to a friend who made them for a big Christmas dinner for family and in laws. Well, she put them in the oven and didn't check them, but, she did not add enough liquids to begin with, so they were really dried out and terrible. BUT they did have some good chewy flavor, if you like that thing. Cover and put into the oven on 300 for 2 1/2 to 4 hours depending on how many pounds of ribs you are cooking. I did read a recipe in Ali Larter's new cookbook Kitchen Revelry, where she talks about putting them in the fridge at this point overnight, and then taking them out the next day and separating the fat from the rest. It looks really interesting and I think I might try that the next time I make them. By the way, the cookbook is absolutely awesome, look for a review soon. What I love about this recipe for company is that you can actually enjoy your company while it is cooking, if you have the mashed potatoes made ahead of time, whip up a vegetable, throw together a salad and you have a perfect menu for entertaining and no stress! I think that is why I have made it so many times for company, it just works out perfectly and I am not running all over and can sit and enjoy! 1 bottle red wine (this is purely up to each individual, I like to add a full bodied cabernet or a zinfandel for more flavor - if you do not want to add wine, you can add beef stock, but the wine really does give it the flavor). 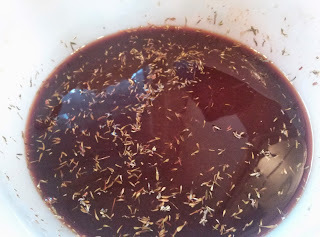 When mixing the liquids, use 1 c. wine, add more wine after the liquids and ribs have been added back to the pot. Follow directions above. As far as the liquids go, I do bump up some of the measurements based on how many pounds of ribs I am cooking. I have used a few different recipes at different times and combined them and changed them up, but this is the one I have been using for a while now. Enjoy! 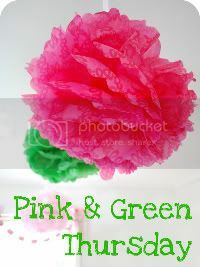 For more fun recipes, check out Tasty Tuesdays over at Nap-timecreations and Anyonita Nibbles!